Longarm Chris: Ooooh, lovely ribbons!! Just a quick post to say that my Urban 9 patch quilt won 1st prize for longarm quilting at our local quilt show and a judges merit for the piecing. 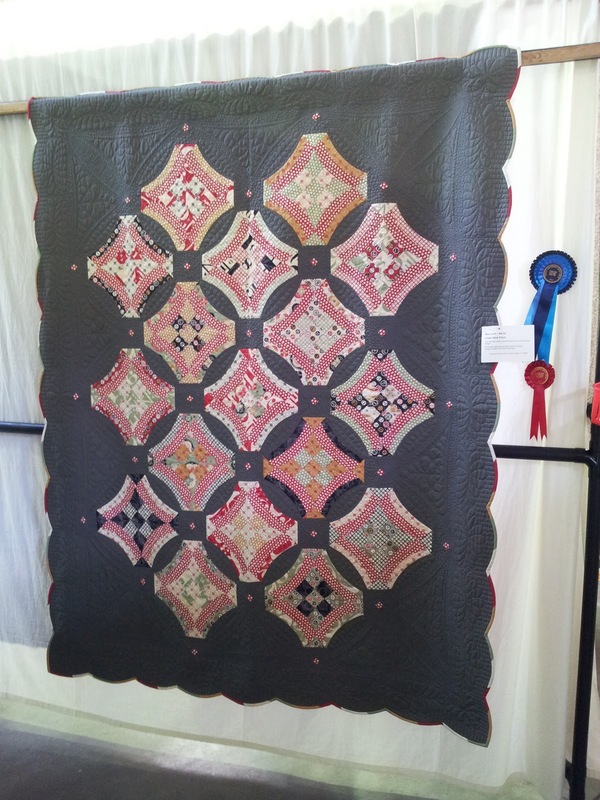 My Spanish plates quilt also won a judges merit ribbon - not sure whether it was for the piecing, quilting or the quilt as a whole. But who cares, a ribbon is nice! The photos are not very good as the quilts are all hung at an angle so it is really hard to step back far enough to get a shot of the whole quilt with the ribbon attached. 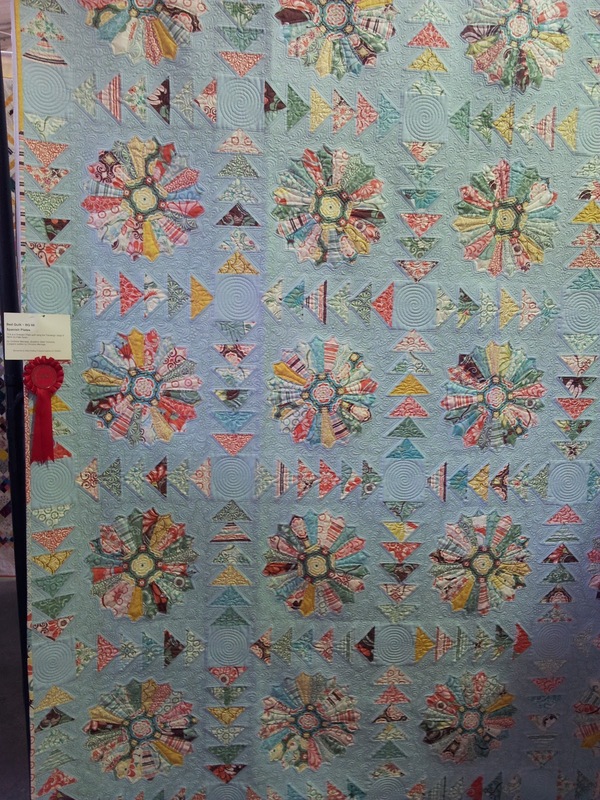 The Great Northern Quilt Show was really well attended which was great to see. It makes getting to the trader stands a bit of a 'push and shove' job, but well worth it. A well attended show means that we are most likely to keep our local show, at least for now. The show always used to be 4 days and was held in 2 halls and now it is 3 days and held in 1 hall. I think quite a few of us 'northern' quilters were rather concerned that we would lose our show, especially as now it always falls a couple of weeks after the quilt extravaganza that is Festival of Quilts in Birmingham, the biggest quilt show in the UK. Thankfully, lots of quilters seemed to have money left to spend with the traders that were here and there were plenty of lovely quilts to look at in the show. I have tried to encourage all my customers to enter our local show to keep it going and it certainly looked like they were doing so. Quilting is alive and well here in the north of England - Hurray!! Fantastic Chris. You should have had someone take a picture with you standing with your quilts. Well deserved! Well done Chris! I look forward to seeing them tomorrow! P.S. Sorry, I forgot to say 'Congratulations!' - oops! P.P.S Any chance you can get rid of the word verification? Pretty please?! Well done you! They're absolutely gorgeous! what a thrill! Congratulations Chris! Your awards are wonderful and so well deserved. It was so good to be able to admire them and be able to tell my man that 'the lady that quilted these award winning quilts, quilted ours'. Your quilting is just beautiful.